This is a tutorial for web developers to add a plugin to your web page capable of sending raw commands to your printer. This is common for Barcodes, Thermal Printing, Point-Of-Sales (POS), and other commercial/industry purposes. Note: Legacy versions of the software leveraged NPAPI which is being phased out by many major web browsers. Chrome, Microsoft Edge, and Opera do not support NPAPI, while Firefox plans to remove support by the end of 2016. Due to this and the development of QZ Tray 2.0, we will soon be dropping support for the 1.9 versions of our software. Please see our roadmap for exact end of life dates on our products. More information on 2.0 can be found here. Your printer is connected as a raw print queue on your workstation with the name "zebra" (this can be changed later). Click on the appropriate link below for instructions. When these two steps have been completed, please move on to the next part of this tutorial. If Java is installed and working properly with the browser, the page display should be gray and not yellow (as shown below). We are now ready to dive into the code behind qz print. We will be looking at the sample.html file provided with the download. This file provides many sample buttons and features. Note: To locate sample.html, navigate to the demo folder. Upon load, the function qzReady will be called automatically. This sample function can be used for both Raw and PostScript Printing. // Automatically gets called when "qz.findPrinter()" is finished. Use html code for a Detect Printer button using standard HTML input button. This button has already been provided in sample.html. 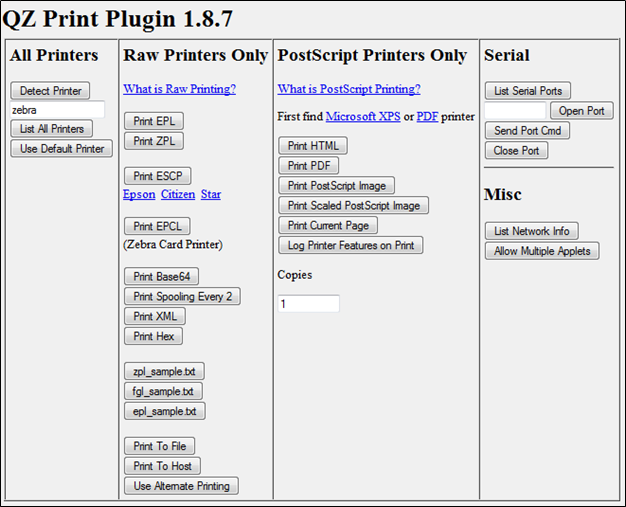 Load page in web browser and click "Find Printer"
View Java console for output. 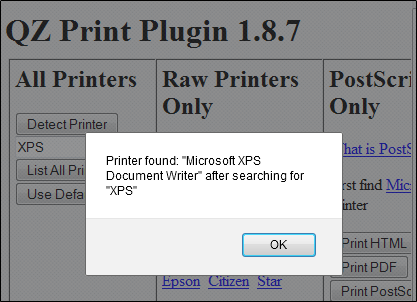 Look for "INFO: Printer found..."
In the image below, "XPS" was searched and successfully detected by the script. Depending on what type of printer you have, various functions can be used. If you would like to send and receive commands through a serial connection, please read the Serial Communication tutorial.